Not only for DSL and VDSL clients the Fritz!Box from AVM is valid as reference since years. For customers, that use LTE-technique as a DSL alternative, there are no comparable products regarding reliability, functions and possibilities of configuration. 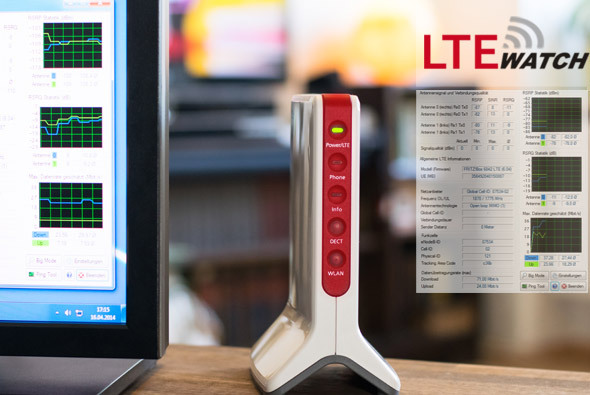 No LTE-hardware is able to offer such detailed data for analysis of LTE connections – for example to optimize reception. With the “LTEWatch”, LTE-Anbieter.info offers now a capable, graduit tool, that makes available all these data by mouseclick, without router-login, as well. In addition, it promises interesting features for beginners and professionals. See next how to download this graduit tool. An insallation is not necessary. Only decompress into any folder and start LTEWatch‏.exe. Now you have to enter once the router-pass-phrase and now “let's go!”. Please insure yourself that the programm Microsoft.Net is already installed. While a lot of other software programms use this, too, you find .Net on quite every PC. If not, you can find this download-link by Microsoft. Tipp: Since version 1.01 you can use LTEWatch also in english. After installation, go to "Einstellungen -> Sprache" an chose "English"! With “LTEWatch” you have all relevant connections and reception data as fast as lightning. The first context menue informs about the signal and qualitiy of connection for every antenna. Here you can see the RSRP and RSRQ including noise of signal, for TxO & Tx1. Besides the general quality of signal in dBm in average, including maximal and minimal values. On the right you have two diagrams of the determined RSRP and RSRQ-value grafically in its temporal history, completed by a third diagram, which plotts the maximal (estimated) rate of data. You can find more information of connection in the paragraph “General information of LTE” for the used provider inckluding its employed frequancy and technique of antenna (MIMO-type). Interested people get to know the global cell-ID of the radio station with wich you are connected. As well, the estimated distance to the radio station may not be missed. In the column “radio-cell” you will be informed about the international phone code (Physical ID), the cell-ID, eNodeB-ID and the tracking area code. So the radio station in the environment can be identified and seperated from each other. The Bigmode - make it large! This function is not only directed to "short-sighted" people, but for those, who use Bigmode as useful help to find the best place in their rooms for the router, or those, who install an exterior antenna. 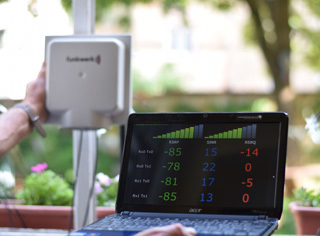 If you, for example, install the monitor near the window, the changes of reception parameters can be followed directly, meanwhile the antenna is aligned, especially in precarious situations, like standing on the ledder or with installations on the roof. Just click right with your mouse to close! With the menue ”ping-tool” you have an important tool to analyse latent times, so called “pings”. Here can be carried out a longtime study for any adress (URL). The results are plotted grafically in the history. The tool calculates at the the same time the average and determines the “packet loss” including jitter. Mathematically this means the variety of the messures. The higher, the bigger are variations. The ideal case is a constant low latent time, that means a jitter of 0. 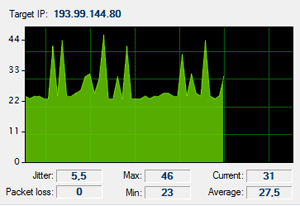 High fluctuations do not seldom mean an instabil connection. Users can configurate times of interval in the adjustments on their own, (milliseconds), in which messures can be made. Another advantage of “LTEWatch” is the frequent acualization of information, in comparison with the Fritz!Box surfice. There the update needs 5 seconds. So it'svery difficult to find out changes in the position of the router. The installation allows only intervals of actualization from at least 1,2 seconds! A real time monitoring is nearly possible. Nearly in the middle, the tool shows the actual used technique of antenna. Ideal is using the 2x2 MIMO moduls, that means two antennas for sending and receiving. If MIMO is not possible, the Fritz!Box changes automatically into diversity modus. The basic station and the router try to find the optimal modus of the antenna. In the third case, for SISO, only one antenna is used for down- and upstreams. The number in blankets behind “Open loop MIMO” shows how often the box had to change from this (ideal) modus into another modus during the times of connection. Now its just a click to make a screenshot and you can post it where ever yout want! P.S. If you like this programm, please recommand it. On facebook and twitter as well!